Pansy Ho Chiu King, co-chairperson and executive director of Macau casino operator MGM China Holdings Ltd, has been appointed as a Tourism Ambassador for the United Nation’s World Tourism Organization (UNWTO). The appointment was in recognition of “her contributions in promoting regional and global tourism cooperation and sustainable tourism,” according to a Tuesday press release. Ms Ho (pictured left) heads the Global Tourism Economy Research Centre, a body created in 2011. She is also among the founders of the Global Tourism Economy Forum (GTEF), an annual event that since 2012 has taken place yearly in Macau. 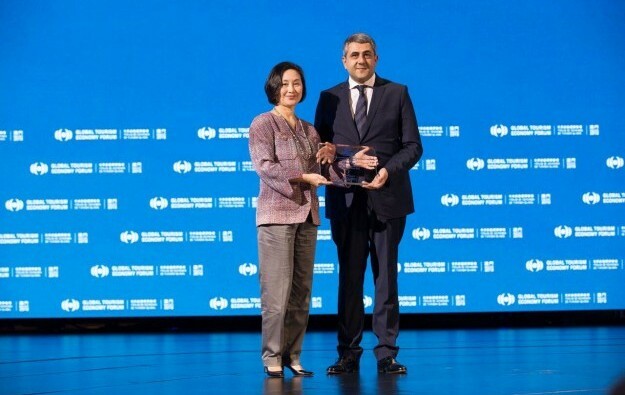 The UNWTO Tourism Ambassador appointment was announced on Tuesday by Zurab Pololikashvili (pictured right), Secretary-General of the World Tourism Organization, during the opening ceremony of the 2018 edition of the Global Tourism Economy Forum. “The ambassador honour is indeed a recognition and affirmation of the efforts of the Global Tourism Economy Research Centre and GTEF to facilitate global tourism cooperation,” said Ms Ho in a statement included in Tuesday’s release. Aside from her positions at MGM China, Ms Ho is also an investor in U.S.-based casino operator MGM Resorts International, with a stake of approximately 4.8 percent. She is also chairman and chief executive of Shun Tak Holdings Ltd, a Hong Kong-listed conglomerate engaged in shipping, property development and hospitality services. Its unit Shun Tak-China Travel Ship Management Ltd, operating under the brand name TurboJET, operates high-speed ferry sailings to Macau. Ms Ho is also a member of several tourism organisations, namely as an executive committee member of the World Travel and Tourism Council and vice chairman of the China Chamber of Tourism. She was also the first official Pacific Asia Travel Association (PATA) Foundation Ambassador.